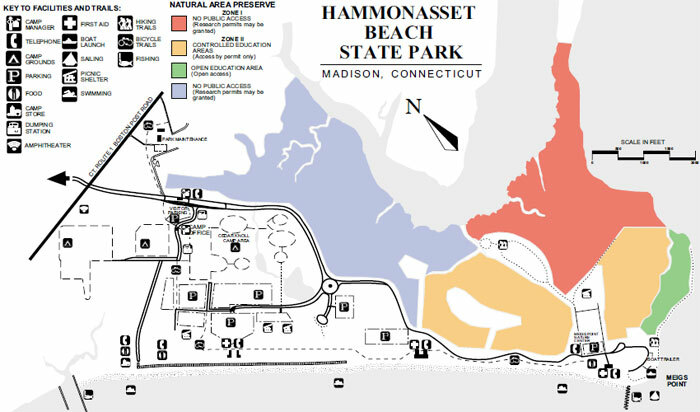 Below you will find all the information available through the Connecticut Department of Energy and Environmental Protection on camping at Hammonasset. Hammonasset Beach State Park is the state’s largest public beach and features facilities for day use and overnight camping. 2018 camping season will be from Memorial Day weekend through Labor Day Weekend due to state budget cuts. Programs are for campers only and are subject to change. Information on Facilities within the park can be found on the CT DEEP website. During your visit, don’t forget to stop by Meigs Point Nature Center. Camping has been a part of Hammonasset since it opened to the public in 1920. Our Park is not only a facility but a place of family memories that have been going on for generations. The friendships you will make last a lifetime. The laughs you will share will be the basis of stories told for years. The movie nights, pick-up softball games, guided nature hikes, shared cookouts, kids activities, just to name a few, will bring you, your family and friends back for years. Enjoy our campground and cherish the memories. The campground at Hammonasset has 556 campsites and 8 rustic cabins for reservation. Reservations may be made through Reserve America (see link below for camping reservations.) or by calling them at 1-877-668-2267. During the camping season, reservations may be made on a walk-up basis at the Campground Office. A processing fee is collected for each reservation, change, or cancellation. Extra fee for Electric and Water sites. More information on Rules and Regulations, included camping party size, equipment limits, and cars is located at the CT DEEP web site. Campground map showing some topography. Facilities for campers include a Camp Store, Bathhouses with hot showers and dishwashing stations and potable water faucets within a hose length of each site. Fires are allowed if off the ground. Fire pits are not provided but the Camp Store does rent them and sell wood. Dumping stations are available for units that are self-contained. Please read this link regarding the Asian Long-Horned Beetle and the advisory not to bring in firewood from other locations. Friends of Hammonasset updated the Campers’ Playground with new swings, a complete Outdoor Fitness Circuit, a new Volleyball net and refurbished horseshoe pits. Don’t forget to bring the bikes! 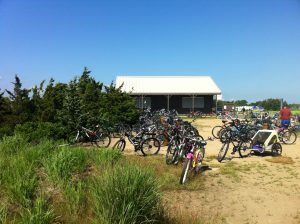 Kids and adults alike enjoy riding on the paved roads and along the trail to Meigs Point. Visit the Meigs Point Nature Center. Bike, walk or ride to the other end of the park to visit the Center. The Center has activities and classes for kids and the family daily (closed Monday) during the season. The Friends of Hammonasset also sponsor a few special visitors and presentations. Don’t forget to check out the Meigs Point Nature Center tab above.